As an industry leader in the production and supply of glass, at Tufwell we are continually improving and investing in the technology and equipment we rely on. Our latest investment in a heat soaking machine keeps us at the forefront of our sector and means we can offer an even greater choice of toughened glass products to our customers.Read on to find out more about the heat soaking process, its purpose and when you, as a client, should consider specifying it.Why would heat soaking be needed?Heat soaking is a process that helps to reduce the risk of spontaneous breakage in toughened glass.To understand the heat soaking process, you first need to understand the basics of the glass manufacturing process. Float glass is produced by melting sand, soda ash, limestone, dolomite, salt cake and other elements together in a furnace to a temperature of around 1500°C. This molten glass then flows into a tin bath, where it floats on top of a layer of molten tin. While this process, done well, creates float glass of near optical perfection, it is unavoidable that, on rare occasions, miniscule undissolved particles can form within the glass – the most problematic of these being nickel sulphide. Nickel sulphide particles cause no real issues for float glass. They are so small to be invisible to the naked eye and they don’t affect the strength of the glass. However, when that glass undergoes the tempering process to produce toughened glass, undetected nickel sulphide can have disastrous consequences – namely, that it can cause the toughened glass to spontaneously shatter. Toughened glass is manufactured through a process of heating followed by rapid cooling, which changes its physical structure, creating what is known as centre tension. This makes the toughened glass able to withstand much higher pressures than standard annealed glass, but also means that if it does happen to crack, it will completely shatter into small pebbles. Because of the rapid cooling rate in the production of tempered glass, inclusions of nickel sulphide don’t have time to return to their original state, and instead maintain their high-temperature state. These inclusions will gradually return to their original state over time, which can cause them to increase in volume and cause additional stresses within the toughened glass. These stresses can, on rare occasions, result in the toughened glass spontaneously shattering. It’s important to point out how unusual this is – it’s estimated that for every eight tonnes of raw glass produced, there will be one nickel sulphide particle somewhere within that glass. The likelihood of that particle causing the sheet of toughened glass to break can depend on a number of factors, including where it happens to lie within the sheet of glass and the environmental changes it is exposed to. The process of heat soaking toughened glass can help to greatly reduce this risk even further. 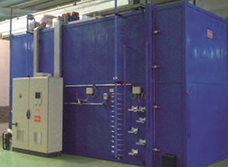 Sheets of toughened glass are fed into the heat soaking machine, where they are heated to 290°C for a number of hours. This process will accelerate the expansion of any particles of nickel sulphide present in the glass – if those particles happen to be near the central tension core of the glass, their expansion will cause the glass to shatter. So the heat soaking process acts to ‘weed out’ any nickel sulphide-contaminated panes, ensuring they are destroyed in the controlled environment of the heat soaking machine, rather than through spontaneous breakage on site. It’s estimated that heat soaking will identify around 95% of contaminated panes. When should I consider heat soaking? Spontaneous breakage is relatively rare, but if toughened glass is going to be installed in a site that is not easily accessed, or where there is the potential for injury in the event of it breaking, you might want to consider investing in toughened glass that has been heat soaked. Heat soaked toughened glass is more expensive than standard toughened glass, but weighing up the additional costs that would potentially come with replacing shattered panes in the field can often mean it is a worthwhile investment. Tufwell recommends that heat soaked toughened glass should be considered on applications such as glass balustrades, glass doors, glass partitions, sloped overhead glazing, spandrels and some structural glazing. If you would like to know more about the heat soaking process, or for a competitive quote for your next glazing project, get in touch with Tufwell Glass.